Yet another film from the collection that got looked over again and again but on one rather gruesome night which also included Cannibal Holocaust I decided to give it a try. A young woman awakes to find she has been kidnapped and is now trapped in the woods with a psychopathic loner. As well as making her perform sordid acts, she must also save herself from ridiculous situations which, if she wasn't hell-bent on making sure her daughter was ok, would be enough to finish anyone off. One rather stomach clenching scene involves a razor blade and her intestines... I will say no more! The cast, as limited as the story allows are brilliant. For 99% of the film we only have interaction from two characters. Both are played perfectly. Nadja Brand plays Hope, the woman caught in this wicked trap and Eric Colvin plays "The Man", Hopes abductor and keeper. The film mixes a great blend of suspense, gore and atmosphere and despite being very low on funding; the production value is very good. They did a wonderful job of pulling everything together with the atmosphere. Very little dialogue to speak of (Ha ha) but that didn't really matter. Just a few glances or a small gesture of the hands from either character gave us enough to know exactly what they were thinking. I did mention that this film was watched the same night I finally built up the courage to watch an unedited bootleg copy of Cannibal Holocaust for the first time. 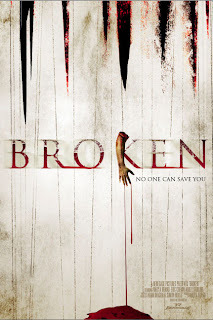 In fact, Broken was a warm up to that little gut-wrencher. However, if I had known just how gruesome Broken was in parts, I may have swapped them round. Having said that, I am not sure if I could ever watch Cannibal Holocaust again. Parts of that film are now permanently burnt into my brain and will haunt my dreams forever!!! Only messing, if you have never seen it. Go and watch it, it is certainly one that any sick, twisted Horror fan should watch. Anyway, back to Broken. There is little else I can say about it without revealing the entire script or some very good shock moments. All I will say is if you ever get a chance to watch this low-budget gem, do it. You will not be disappointed. It is quite disheartening that with films like Saw and Hostel doing so well, this little exploitive number didn't really see the light of day before being sent to the back of class but I would certainly put it in their league. Especially Hostel which wasn't really that good! Just saying.